Kivi and Mattila  analyzed and improved the work postures in the building industry by using the computerized OWAS method. A toatal of 6,457 postures were observed and the observations were always made at 30 second intervals and the total observation period was about 1.5 h per task. From their finding, 27.8% of cement worker were category in poor work postures and which need to be corrected soon or immediately. They also said that the OWAS analysis provided the opportunity to compare the jobs studies according to the number of postures which need to be corrected soon or immediately. 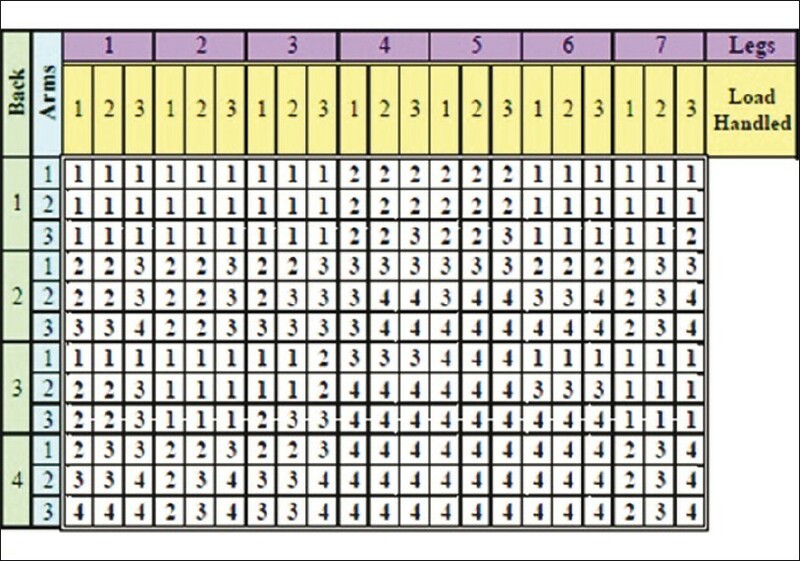 Besides, the computer programs show a detailed analysis of the distribution of posture observations into categories in need of corrective measures. Some corrective measures on work redesign, work environment or the equipment used at work and correct work postures were suggested to minimize the WMSDs problems. Mattila et al, analyzed the working postures in hammering task on building construction sites by using the computerized OWAS method. According to their study, 593 different postures were analyzed and a total 7.8% of postures adopted by the workers during various hammering tasks were classified into OWAS categories III or IV, it indicating that the postures should be corrected either soon or immediately. They also clarify that for the workers using the non-powered tools during their work, the parts of the body most affected were upper extremities, back, lower extremities, trunk, head and neck. The computerized OWAS method for postural data analysis proved to be a very useful way to reduce postural load of dynamic hammering task. Saraji et al, evaluated WMSDs risk factors among the crew of the Iranian Ports and shipping organization's vessels. This paper clarifies that WMSDs are major problem in almost all countries and are important causes of work incapacity and loss of work days. The aim of their studies is evaluation of WMSDs symptoms among the workers by using nordic musculoskeletal questionnaire (NMQ) and determination of WMSDs risk factors by application of OWAS. After determination of risk factors, the OWAS methods can be used to identify any possible correction in working posture that leads to a better and less harmful posture. According to their finding from the NMQ, the highest prevalence of MSDs symptoms among all participants, there are 32.9% of workers were related in low back pain, 26.4% in knee pain and 18.8% related in shoulder pain. If category it to the different job. For driver, the result show that 33.3% have MSDs symptoms in elbow, 30.8% in feet, 32.7% in ankle and 27.3% in shoulder. For captain also showed highest rate of symptoms at low back, back and leg which are 22.9%, 29.6% and 28.6% respectively. The OWAS results rated postures of captains, deck officers and wheelmen in action category 1; it meant that their postures were harmless for musculoskeletal system. Postures of electrician officers, dredger offices, seamen and cooks were rated in action category 2 of OWAS. Postures of chief engineers, chief officers, motorists and boatswains were rated in action category 3 of OWAS, which meant that preventive measures should be taken as soon as possible. If considering the working h, in 33.7% of working h crew had a posture that was related in action category of 1 (no harmful effect), 37.9% in category 2 (some harmful effect), 19.6% in category 3 (distinctly deleterious effect) and 8.8% in category 4 (extremely deleterious effect). For chief engineers, chief officers and motorists rated in action category 3 of OWAS and dredger officers, risk factors that resulted to MSDs symptoms in shoulder region were cause by the awkward postures and excessive workload during most of working time. According to Scott and Nicola R. Lambe  clarify the potential for musculoskeletal discomfort or injury can be related to the amount of time spent in a particular position. Their studies were investigated the working posture in a manual collection of eggs by using OWAS method. According to the result get from OWAS system, climbing on the perches was considered extremely uncomfortable during the exercise. Similarly, bending to inspect nest boxes can potentially because posture discomfort and strain. Through the finding from the OWAS assessment, the result may help to improve the working posture and to minimize the WMSDs. The LPG worker that is the delivery men carry heavy cylinders on their shoulders and back. The weight of the cylinders are 14.2kg, 16.2kg, 19.2kg, 32kg, 40kgs etc. They have a tedious duty of 8 h a day and they are mostly associated with loading and unloading of cylinders. The different postures that they use while loading and un-loading are graded using OWAS posture code which was used similarly in a study done by Ismail et al to assess the awkward postures in assembly workers. The OWAS grades are then categorized to ascertain the harmful effects that their postures can have on different body segments and how can they lead to harmful effects on musculoskeletal system. Their job demands a high intensity of physical strength. They are exposed to high level of physical demands and relatively lesser amount of rest which makes them vulnerable to injuries over a period of time. The reporting time for all the workers is 8.00 in the morning. They work for 8 h in a day. They have been allotted a distance of 4-5 kilometers where they have to deliver the cylinders. They have to deliver 30-40 cylinders in a day. Their job comprises of lifting the cylinders and loading it onto their cycles which they have to drag to the respective places. They have to unload the cylinders from the cycles and lift the cylinders all the way to the houses into their kitchens and unload it there. Their job demands a high amount of physical activity which leads to a great amount of postural impairments. A proper evaluation of their postures should be done in the companies which they fail to do and so the workers land up with various postural problems which have a harmful effect on their musculoskeletal system. Thus the purpose of my study is to find the awkward postures that cause discomfort to them and what corrective actions should be taken for improvement or prevention of further problems. To identify awkward postures and its ill effects on body segments causing discomfort to LPG workers in India. 1. Awkward postures while loading and unloading of LPG cylinders using OWAS (Ovako work assessment system) in order to assess the area of discomfort reported by the Assessment of postural loading among the LPG workers. 2. Effects of the postures attained while loading and un-loading the cylinders on various body segments. 3. Levels of action category which gives guidelines as to whether the postures are harmful or not. 4. Whether they need immediate changes or not. Recommend the same if needed. A questionnaire was prepared comprising of the validated posture scales like OWAS (Ovako work assessment system) posture code along with certain set of questions that included the general information of various postures of LPG worker. This questionnaire was validated and 100 workers were approached with the questionnaire and were explained about the nature and details of the project. A cross section study was done with a sample size of 100 workers. Generally, the outcomes of this study can be categorized in four groups, which are collecting data about the work discomfort from the workers and observation of work tasks and working postures, analyze the posture data by using software, identify the awkward postures and give a recommendation of new working postures to minimize the work related musculoskeletal disorders (WMSDs) problem. [Figure 1] show the step of the methods use in this study. Using OWAS Method: The OWAS method is collects observation information on worker postures on back, arms and legs. It has 252 (4 × 3 × 7 × 3) posture and load combination, which are combination of four back postures, three arm postures and seven leg postures with three estimate loads, [Table 1] and [Figure 1]. Each posture of the OWAS is determined by the four digit code in which the numbers indicates the postures of the back, the arms and the load needed. Observer need to identify OWAS posture code of each selected posture. 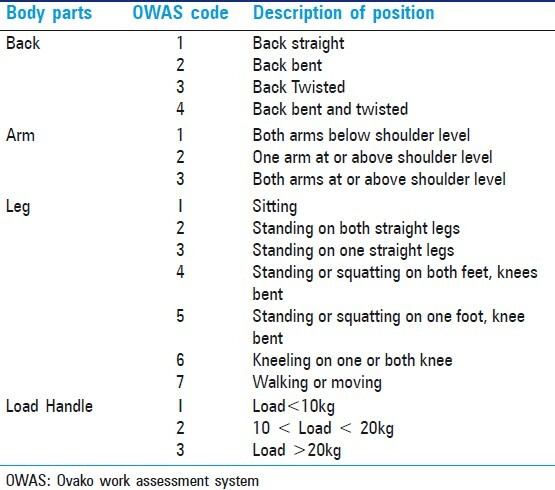 Each OWAS posture code then will be analyzed by using the individual OWAS classified posture combination to get the action category for each work phases. The classification for individual posture combination indicating the level of risk injury for the musculoskeletal system. If the risk for musculoskeletal disorder is high, then the action category indicated the need and urgency for corrective actions. The action categories for each individual postures are presented in [Figure 2] and explanation about OWAS action categories for prevention shows at [Table 2]. Prolong time spending in one particular posture may cause musculoskeletal injury. Therefore, the next analysis is identifying the OWAS action category by calculate the total time spent in different postures for each body part for one complete work task. The result from OWAS analysis was used to identify the awkward postures. From OWAS action category, we can identify which body segments bring discomfort or injury to the worker. Besides, the levels of action category for both methods give a guideline to the observer whether the working postures are in harmful or not and whether it needs to be change immediately or not. Statistics was done using the SPSS version 16. A frequency Table was formulated and the analysis was done using pie chart representation of the population of LPG workers was obtained through the system. Purpose of the study was explained to all the participants and a written informed consent was obtained from them. The study protocol was accepted and passed through the ethics committee of Pad. Dr. D. Y. Patil University, Nerul, Navi Mumbai, India. From the study it is clear that maximum workers fall in category 4 while loading the LPG cylinder, i.e. 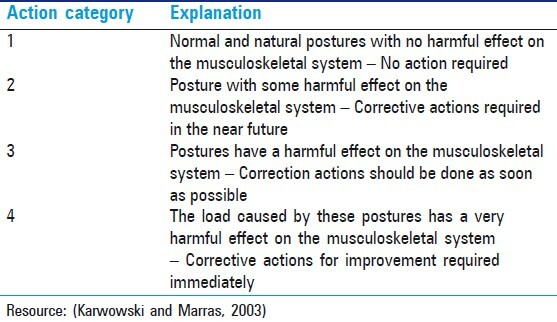 the load caused by the postures have a very harmful effect on the musculoskeletal system and corrective actions for improvement required immediately. [Table 3] Also, while un-loading the LPG cylinder maximum workers fall in category 3 i.e. postures have a harmful effect on musculoskeletal system and corrective action should be done as soon as possible. [Table 4] It can also be ascertained that the LPG workers who participated in this project suffered from the following musculoskeletal problems, viz, Back 34%, Shoulder 20%, Knee 20%, Neck 16%, and Toes 10% [Table 5]. In general, subjects tended to perceive their arms and trunks to be more horizontal than they actually were, thus leading to slight overestimations in the criterion loads in some cases. In several instances, loads on the lower back were obtained from multiple combinations of arm and trunk postures chosen by subjects for the same task. This suggests that if subjects' postures are not also considered visually it could be erroneously concluded from the numerical estimates of load alone that there are no problems with how subjects perceive, recall and describe their working postures. Most of them fall in category 3 and 4, which means postures have harmful effect on musculoskeletal system. Majority of them also suffer from severe injuries to back, shoulder, and neck, hands and toes due to following reasons. The LPG worker while lifting heavy cylinders often adapt a position of lumbar flexion in order to distribute the load. But this invariably leads to degeneration of lumbar spine. The lumbar spine in normal subjects is already loaded with the weight of head, neck, arms and trunk. When lumbar spine is flexed there is contraction of abdominals and stretching of back extensors. Due to prolonged stretching of back extensors the lumbar spine is put under a mechanical disadvantage. Most of the time spine is in flexed position during working h, due to this there is localized fatigue in the spinal muscles and stress on posterior longitudinal ligament. Constant posture also leads to spasm of spinal muscles. Also due to prolonged stress there is strain on muscles and ligaments which decreases their ability to support the spine. Due to prolonged strain, ligaments, capsule, intervertebral disc of lumbar spine may creep and may be liable to injury if sudden forces are unexpectedly applied. Increased muscle action also causes increase in intradiscal pressure. The increased pressure causes redistribution of hydrostatic fluid and in turn stretches the annulus fibroses which affects the posterior longitudinal ligament. Inadequate rest pauses in between the working h also increases load on spine giving rise to low back pain. This arises primarily due to the position adapted by these workers during lifting the cylinder on their shoulder. Since the shoulder remains in a state of flexion and/or abduction for most of the times, this leads to excessive tension on shoulder stabilizers. Also, due to prolonged maintenance of this position there is a tendency for formation of micro ruptures and adhesions that can occur, which in turn may lead to shoulder injury in these subjects. The primary reason for neck pain is repetitive loading of the spine. Due to this loading it causes continuous compression of the cervical spine due which there are increased mechanical forces on the cervical spine which is already loaded with the load of head and neck. Due to prolonged loading of the spine there are degenerative changes in the discs. There is an outward shift of nucleus pulposus and degeneration of annulus fibrosis. There is also decrease in water content in the disc which makes the spine prone to injury. The reason for an injury to toes is the improper griping of the cylinder with hands due to which the cylinders drop on their toes. And while lifting the cylinder there can be an injury to their hands as well because of the load of the cylinder. 1. 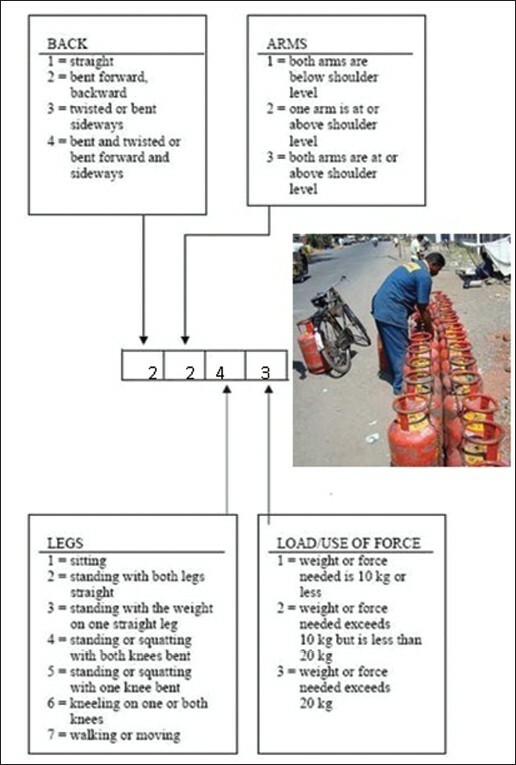 This study presented an ergonomic assessment of LPG worker (delivery men). The results show the workers work in awkward postures i.e with the back bent and twisted, the arms above the shoulder level, standing or squatting on both legs with knees bent, and load > than 20 kgs. They transfer the cylinders in poor postures and with high motion repetitiveness. Regarding to work discomfort survey questionnaire, the postures cause ill effects on their body segments. 2. Majority of workers also complained of severe injury to back- 34%, shoulder- 20%, knee- 20%, neck- 16% and toes- 10% .3. Among them 90% fall in category 4 while loading the cylinder i.e. the load by those postures has a very harmful effect on the musculoskeletal system-corrective actions for improvement required immediately. 4. And while unloading 70% fall in category 3 i.e. postures have a harmful effect on the musculoskeletal system-corrective actions should be done as soon as possible. Several actions can prevent and reduce amount of low back pain. Posture modification, strength training and stretching exercises can be taught to them. Good postures reduce the stress applied to soft tissue surrounding the spine. Maintaining the normal S-curve of spine can reduce low back pain. Stretching and strengthening regimen for the muscles of trunk is a way to stabilize the spine and increase flexibility. If you stand for longer periods, rest one foot on low stool to relieve pressure on your low back. Rather than a cycle or a vehicle which they have to drag with their hands they can be provided with autos so that their work load can also be minimized. If possible there should be two men where one can pass the cylinders down to the other, rather one man alone taking the load on himself. STANCE: Wide foot base, symmetrical base, stance close to the object. POSTURE: Shoulders should be symmetrically aligned above pelvis. BACK: Maintain proper lordosis, back should be stabilized, lift is performed smoothly, there should be no jerky movements. OBJECT: Grip the object firmly, add forearm support if the object is too bulky. TURNING WITH LOAD: Never twist the body leaving the feet still, always keep the body in straight alignment, move the feet around. REST PAUSES: Take frequent rest pauses, rest before sensation of fatigue, and avoid working to the point of fatigue. 1. Moore A, Wells R, Ranney D. Quantifying exposure in occupational manual tasks with cumulative trauma disorder potential. Ergon 1991;34:1433-53. 2. Winkel J, Dallner M, Ericson M, Frasson C, Karlqvist L, Nygard C, et al. Estimation of Physical Load in Epidemiologic Studies. In: Designing for everyone. Proc Eleventh Congress of the International Ergnomics Association. United Kingdom: Taylor and Francis; 1991. p. 227-53. 3. Baty D, Buckle PW, Stubbs DA. Posture recording by direct observation, questionnaire assessment and instrumentation, The Ergonomics of Working. Postures. United Kigdom: Taylor and Francis; 1986. p. 283-92. 4. Pinzke S, Kopp L. Marker-less systems for tracking working postures: Results from two experiments. Appl Ergon 2001;32:461-71. 6. Kivi P, Mattila M. Analysis and improvement of work postures in the building industry: application of the computerized OWAS method. Appl Ergon 1991;22:43-8. 7. Mattila M, Karwowski W, Vilkki M. Analysis of working postures in hammering tasks on building construction sites using the computerized OWAS method. Appl Ergon 1993;24:405-12. 8. Saraji JN, Hassanzadeh MA, Pourmahabadian M and Shahtaheri SJ. Evaluation of musculoskeletal disorders risk Factors among the crew of the iranian ports and Shipping organization's vessels. Tehran, Iran: School of Public Health, Tehran University of Medical Sciences and I. R. Iranâ€™s Ports and Shipping Organization; 2004. 9. Scott GB, Lambe NR. Working practices in a perchery system, using the OVAKO Working posture Analysing System (OWAS). Appl Ergon 1996;27:281-4. 10. Ismail AR, Yeo ML, Haniff MHM, Zulkifli R, Deros BM, Makhtar NK, et al. Assessment of postural loading among the assembly operators: A case study at Malaysian automotive industry. European Journal of Scientific Research ISSN 1450-216X Vol.30 No.2 (2009), pp.224-235. Al Amin, M.S., Nuradilah, Z., Isa, H.,Febrian, I., Taufik, R.S.